I’ve been dying to try this recipe for Cranberry Pumpkin muffins from the moment I first spotted it (it’s from my newly acquired copy of The Farmhouse Cookbook by Susan Herrmann Loomis). I was not disappointed, they were a delicious way to start our day. The muffins are tender and fluffy, and are a delightful golden colour (it doesn’t really register in the photo). 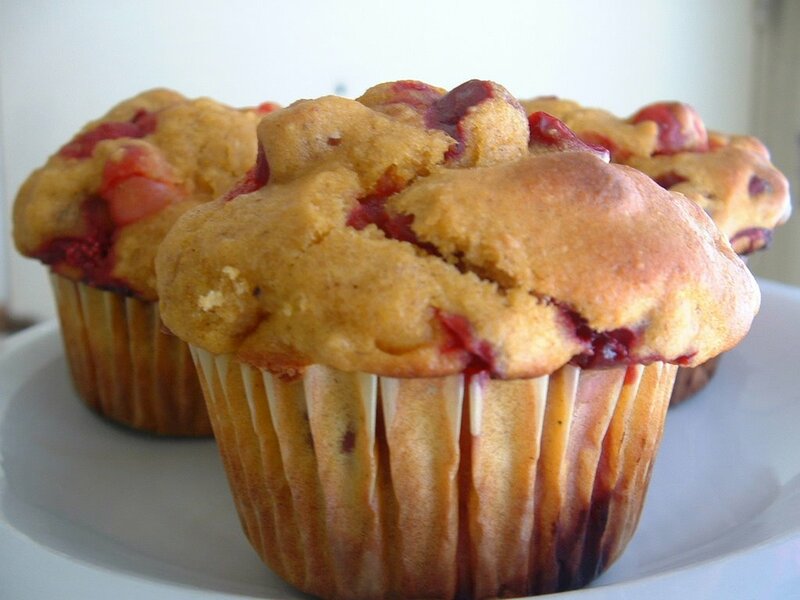 They’re not too sweet, and the cranberries give them a slightly tangy flavour. I think they’ll quickly become a family favorite. Preheat oven to 400 degrees. Grease a 12 cup muffin tin well.Mix dry ingredients together; set aside. Whisk oil, eggs, pumpkin and milk together in a medium sized bowl. Add dry ingredients to the wet and stir just until combined. Fold in the walnuts and cranberries. Do not overmix. Fill prepared muffin cups 2/3 full (mine were totally full, but they didn’t overflow at all).Bake until muffins are puffed and golden and spring back when touched, 20 – 25 minutes. Check after 20 minutes, as overbaking will result in dry muffins. Let the muffins cool for at least 5 minutes before releasing them from the pan.Makes 12 muffins. Sounds delicious and I’m sure the colour is just lovely. I love that book! It’s been one of my favorites for about 10 years now. That’s a very yummy recipe! Cheryl, I brought my bay leaf in this morning. It looks pretty inside and now I can have fresh bay all winter in my soups and stews. I got the French Farmhouse Cookbook at the library Thursday. And, uh-oh, I HAD to purchase it on Friday at a bookstore. It is THAT good and reminds me of the foods I have eaten there. Your muffins look superb. Today I made the Cottage Cheese Apple Pancakes and they were scrumptious. Do you have an email link on your blog? Thanks for the tips and sharing. Carla – They’re great, I’m sure you’d love them! Steph – I’m starting to wish I’d bought it years ago! I’m glad you liked the pancakes! I don’t have an email link on there at the moment, I’ll see about adding one. thanks for the recommendation on the cookbook. those muffins look yummy. Karl – You’re welcome, and thanks! I finally got around to trying these — yum! Thanks for sharing the recipe, it’s perfect for a fall morning. Leanne – Aren’t they great? I just made another batch today, too! Those muffins look so delicious! Have you tried any other recipes from that cookbook? Hello, After sifting through a few recipes that resulted from a seach not only did I have and like the ingredients in the recipe you typed out, as I was specifically looking for pumpkin cranberry using Whole Wheat–I liked the part where you referenced a book and also noted that you were courageous and used a different measure than what was exactly called for! I am experimenting using Organic Whole Wheat Graham flour that has been sitting on the top shelf, and that actually has a date stamped of Feb. 2009. A woman I work with made, I think dated Organic brownies, and they were gone in no time. I wish I can bake entirely from scratch but the chemistry of different ingredients and flours can be tricky. Little by little. Mary – I hope you tried these and liked them. I'm just waiting for a batch to come out of the oven as we speak (using up our halloween jack-o-lantern).